I dont have the original one...lol!! However, I can show another G3 or G1 beside her if thats of any interest? Do you mean the little Comic Con one? Art pony size and shape? Or another one? If you have any idea where you might have seen one similar please let me know - she really has me puzzled and I would love to know more. 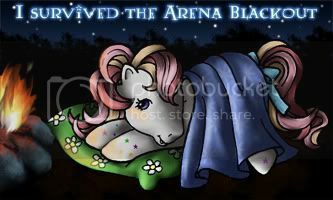 I'm pretty sure it was in the clone pose like the art ponies, yes. Is there one like that? I'm so confused, lol. So this one is like styling sized? I didn't pick up on that. The one I had seen must have been normal sized. I think I first saw pictures at the TP, but they don't keep old threads like the Arena does (or at least I can't find them). BC - this is the design from the 2011 comic con exclusive, so that's the pony you've seen. 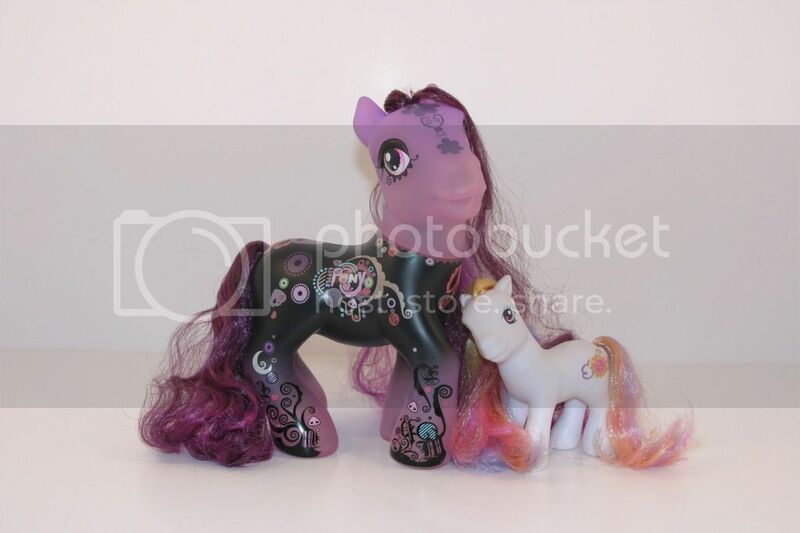 Hathor came across someone selling these - the same design but on a styling size pony in the raindbow dash pose. My guess is these were a test run for ponies to be used on display at comic con and then hasbro decided they were too small and did not use them. Or else they were made for staff members or something. That super huge one is even more amazing, I guess it has the same size like the giant blank ponies. He he he ... ok - will do ... I cant edit my first post so I ll add a picture here in the morning when I get my camera back! She is amazing ! I just PMd you by the way! My best guess would be that they tried out larger prototypes in various poses, to choose one? I love mine I paid $23 for mine. But mine is US release and I think it is slightly smaller. Cool! ...Looks very Junko Mizuno! Your right the design does remind me of her work. Those Comic-Con pony's never disappoint in the interesting design department. Makes me sad that I wasn't able to attend this/last year.